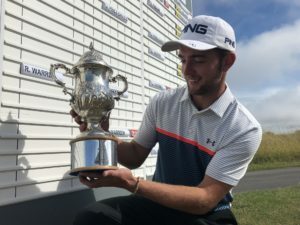 Part-time greenkeeper Tom Williams claimed the Welsh Amateur golf title, to underline his desire to make a living putting on the greens rather than tending them. The Wrexham 20-year-old beat Southerndown’s Kieron Harman 2&1 in the final at Machynys golf club in Llanelli, after finishing second to Irish Boys champion Archie Davies in the stroke play stages. “I knew I was playing well coming into the week, so it was a matter of getting the putting right,” said Williams. “I am working three to four days a week at Wrexham golf club greenkeeping just to fund my golf. I have done that since September last year so I did not get that much practice over the winter months. “When I wasn’t working I was struggling to pay, now I am earning money I am struggling to practice, but I enjoy it and it makes you want to work harder. “It shows you a different side to life and makes me want to earn a living playing golf rather than raking bunkers. “It does help me understand the golf course and the greens better, I have learned a lot, but it opens my mind to the different things going on with the course and that takes my mind off the golf when I am playing. Williams has been a Wales international for a few years, but has moved up the ranking this year following the likes of Walker Cup pair David Boote and Jack Davidson turning professional. The Wrexham player wants to follow in the footsteps of former foursomes partner Jack Davidson who is playing on the Challenge Tour. “I reached the semi-final two years ago and lost to David Boote and that week felt like a win because I was playing really well. “I have had a lot of experience playing for Wales which helped me this weekin terms of staying calm and keeping everything together. “Jack was my foursomes partner from Day 1 in Wales teams, so seeing him going on to the next level makes me just want to join him really. It is fantastic to see a close friend like that come through. “I would like to give I another year at amateur level, work hard through the winter and hopefully get Walker Cup next season. I want to start finishing higher in British events and around Europe, but winning this Welsh title gives me a lot of confidence going forward. “At the end of next year I would maybe think about turning pro and seeing how it goes. I have played amateur golf for a long time and you cannot win any money so I would like to get something out of it because I have put so much in growing up. “Hopefully I can stay the highest amateur in Wales, work really hard and see how it goes. There are a couple of event to finish off the season,the Home Internationals as well and hopefully I will be able to get into the World team championships after this win. “Because it was so windy it was about keeping control of the ball flight, staying focused and trying to find the best point of the green, getting the course management right. Williams was also able to turn his greenkeeper’s eye onto the condition of the Machynys course – and he was impressed. “Machynys was in fantastic condition,” he said. “To get the course in this condition after all the dry weather they have had was absolutely phenomenal. Tenby’s Luke Harries and Fairwood Park’s Rowan Warren were the losing semi-finalists, with Luke’s brother Jack making it a great week for the family by reaching the quarter-finals. Wales Golf championships manager David Wilson added, “Congratulations to Tom, a worthy winner who played strongly all week.